Our PADi Divemaster internship program is built around you, your previous experience and your needs. Every diver is different and we understand that to gain the knowledge and experience you need to become a dive professional takes time, patience, knowledgeable teachers and commitment. 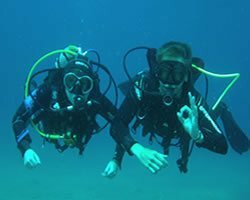 Lanzarote Dive Centre has some very experienced PADI/ TDi instructors who can help you gain the best scuba diving experience. If you are thinking of working to gain your qualification, becoming a professional or simply to live in a beautiful place for a few months, then you should think about our internship course. We are looking for our candidates to be punctual, polite and committed. Spanish/English or German/English languages are a plus but not essential. Price will be given on application as it is dependent on previous qualifications, what learning material you have already and dates available. As part of your Divemaster Internship here at Lanzarote Dive Centre, we include, at no extra cost, the all essential PADI DSD Leader internship. This is the certification that enables you as a PADI Divemaster, to conduct the Discover Scuba Diving (DSD) programme. This is an important part of your dive professional development as a DM intern because it prepares you to take responsibility for 2 inexperienced student divers completing a Discover Scuba Diving experience. You will learn how to complete the paperwork, conduct a full DSD dive briefing and how to demonstrate the DSD skills to instructor level. You will learn to assess the suitability of the conditions in relation to your students abilities and inexperience, as well as assist them on the surface and below the water, ensuring the safety of yourself and your students at all times. You will complete a minimum of 5 DSD’s under the supervision of one of our experienced instructors. During these sessions you will practice your presentation skills and take more and more of a lead role until you are completing the whole Discover Scuba Diving experience for yourself. Becoming a DSD Leader is your first step in teaching scuba to student divers and takes you one step closer to becoming an dive professional instructor. 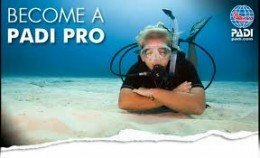 Your instructor may also offer the PADI Deep Diver and PADi Search and Recovery Diver specialty diver courses along with your divemaster training to help you meet all requirements and to broaden your abilities.